There are times when the ache returns, sharp and clutching, and there are times when I feel the most profound joy and amazement and gratitude. On April 4, 2017, my father died after a year-long tug-of-war with brain cancer. He was two months shy of his 70th birthday. I was with him for five of the six weeks leading up to his death, keeping watch first in his old stone house in a tiny village in Brittany, France, and then, in a series of rooms at a local hospital, navigating the final geography that marked his illness. There was no cure to his cancer—it would keep advancing, no matter the armada of treatments he might throw at it—so there was nothing to do but keep him company and bear witness to the movements of his disease and reporting what I saw to family and friends who could not be there. I kept a daily diary of my time in France, posting the entries publicly on Facebook, along with photographs of the landscape around me. It felt crucial to mark this moment with every bit of detail I could muster, to pay exquisite attention to every aspect of the experience. I don’t know, exactly, why I felt so compelled to do this, but perhaps it’s that I was struck by the unexpected beauty and grace of this passage and the things it was teaching me about myself and my father and about a myriad other things, and I didn’t want to simply have gone through it. It is almost two years later, and what I’m struck by is the way grief has been metabolizing over time. At first, the acute sense of loss, of my father’s sudden gone-ness, felt like a vacuum, a suction of energy that was both painful and irresistible. There was a part of me that wanted to get lost in it, to disappear into the depths of that force. As the months ticked on, I edged away from the raw and ragged pieces and began re-experiencing my father through his own words—letters and emails he’d sent me over the years—as well as the lessons that being his daughter has revealed to me. Over time, the view has lengthened and deepened and softened. There are times when the ache returns, sharp and clutching, and there are times when I feel the most profound joy and amazement and gratitude. For me, grief is a feral animal I have learned not to resist, and I hold my arm out, letting it take the lead when it needs to. But it is also something that feels a part of me now, a weave in the fabric of who and how I am in the world. 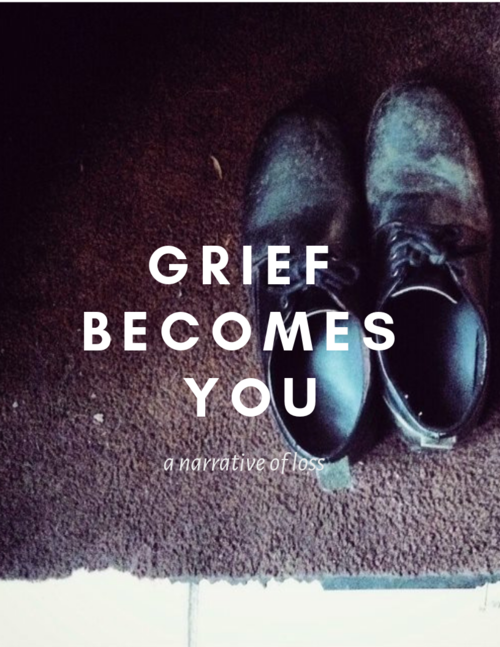 It feels important to have a place to land these experiences, and especially to give voice to the quieter, more shadowy, more elusive aspects of grief’s landscape, wide as it is. I’ve had it in my mind for awhile now to create a collection of stories, images, and other narratives of loss. It feels important to have a place to land these experiences, and especially to give voice to the quieter, more shadowy, more elusive aspects of grief’s landscape, wide as it is. My hope is to gather a broad spectrum of written and visual material that brings to light the nuances of these narratives, and all of the attendant feelings and experiences that are part of the process of moving through it. If you have written about grief, I’d love to hear from you. If you have photographs that reflect some part of the grief process you’ve witnessed, I’d welcome those as well. For this collection, I mean “grief” in all of its forms and manifestations. If there are experiences that feel connected and relevant to this topic, I’m all ears. I am also interested in stories that I may share in a future podcast series (either in my voice or yours). My hope is to get this collection soon, so I would like to gather your submissions by May 15, 2019. For questions and details (submission length, format, etc. ), please email me at hello@mayastein.com. Maya Stein is a Ninja poet, writing guide, and creative adventuress. 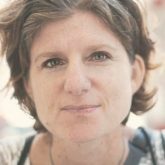 Among her latest escapades are a 1,200-mile bicycle journey with a typewriter, a launch of a French crepe stand at a Massachusetts farmers market, a cross-country relocation, and most recently, marriage and step-motherhood. Currently living in Northern New Jersey, she can also be found wandering the backroads by tandem bicycle, writing poetry for strangers on index cards, and online at www.mayastein.com.